LANCASTER- – The University of Antelope Valley Pioneers (11-12; 9-2 Cal Pac) had their six-game winning streak snapped on Thursday evening after suffering a defeat at the hands of the Redhawks of the Benedictine University at Mesa (15-11; 4-7 Cal Pac), 77-68 in intercollegiate California Pacific Conference men’s basketball action inside the Pioneer Event Center. The Pioneers still sit atop the Cal Pac standings with a narrow one-game lead over the Red Hawks of Simpson University as all teams but one remain in contention to earn a spot in the Cal Pac Championships later this month. Embry-Riddle is UAV’s next opponent on Saturday afternoon as the senior members of the Pioneers’ team will be honored before the contest for their hard work inside the classroom and on the court during their careers at UAV. UAV senior forward Christian Drayton (Lufkin, TX) collected another double-double, scoring a team-high 17 points and 13 rebounds to go along with three blocks and two assists, and junior guard Kamal Holden (Los Angeles, CA), junior forward Kane Keil (Auckland, New Zealand), and senior guard Miles Nolen-Webb (San Diego, CA) each added 11 points. UAV hit 24-of-68 field goals (.353), 4-of-21 three-pointers (.190), 16-of-30 free throws (.533), and were outrebounded by the Redhawks, 49-48. UAV committed 14 turnovers and stole the ball 10 times. 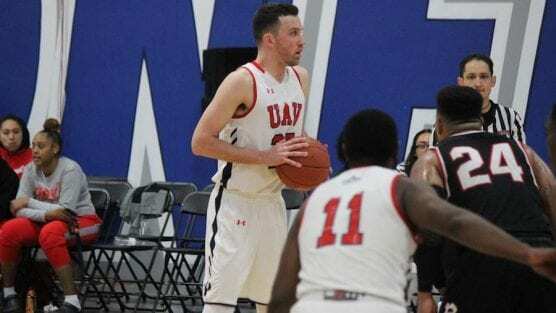 BENU made 24-of-63 shots (.381), 8-of-17 three-pointers (.471) and 21-of-28 free throws (.750) and committed 16 turnovers and stole the ball from UAV eight times. Next game: Coached by Darwin Cook, the Pioneers remain at home to host Embry-Riddle Aeronautical University for a California Pacific Conference contest and Senior Day on Saturday, Feb. 9 at 4 p.m. PST inside the Pioneer Event Center in Lancaster, Calif.